An elegant oval writing table of the French Transition period. 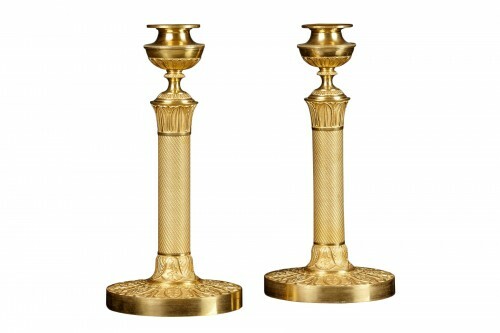 The table has four curved and and tapering legs that end in fire-gilt bronze sabots. The top has a fire-gilt bronze openwork gallery consisting of connected large and small circles. The gallery is cut out at the front. The table top is decorated with an oval shape with a trellis pattern in sycamore with ebony and boxwood trimming. Around that shape a simple band in tulipwood and a laurel wreath in bois teinté that is held together at four sides by a crossed ribbon. The wreath is adorned with little red berries at the end of the leaf motives, that have kept their color remarkably well. The outer rim is again tulipwood that is applied with the grain directed to the center of the table. The frieze is veneered with tulipwood and on four sides with a wide strip that repeats the decoration of the table top center. 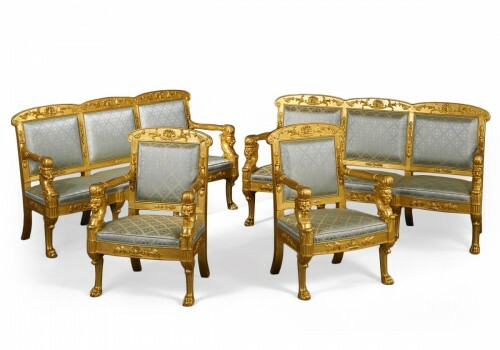 Noteworthy is the fact that the strips are trimmed with an ebony rim at the right side and the bottom, whereas they are trimmed with a light boxwood rim at the left side and the top. This gives a playful effect and creates an impression of relief. A retractable writing tablet is positioned at the front of the table. The writing leaf is lined with green leather. 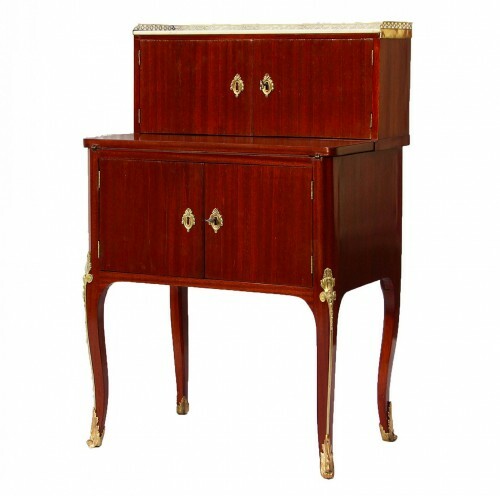 A lockable drawer is positioned at the right side of the table, containing a silver plated inkwell and sander. 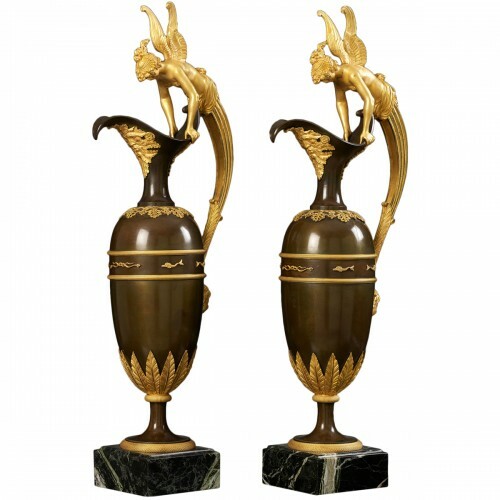 Between the legs there is shelf that is lined on three edges with a protective rim in gilt bronze. At the front, the shelf has been cut out to create room for the legs of the user. The veneer on the shelf is copying the decoration at the top, without the wreath. At the top of the legs, just under the table top, there is a gilt bronze decoration in the shape of a capital at the top and leaf motives at the bottom. The scrolling leaves follow the shape of the curving legs. To accentuate the shape of the legs, a small contrasting ribbon is fitted at the inner and outer edge of the legs. Together with the effect of the curving legs, that appear to extend all the way up under the table top, the dark edge gives the table a very light and elegant character. 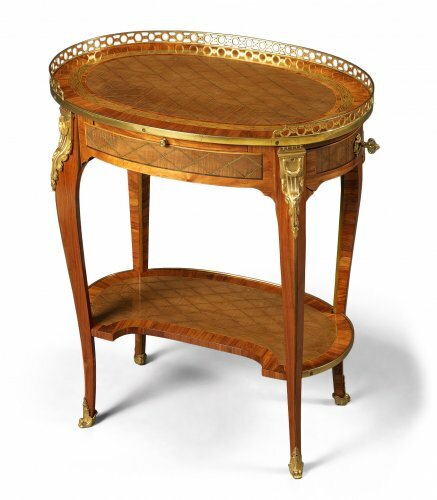 Before the Transition period, oval tables are very rare, but by the end of the Louis XV period they become increasingly popular. The tables can have many shapes and functions. Next to writing tables, there are also gaming tables and breakfast tables and the like. 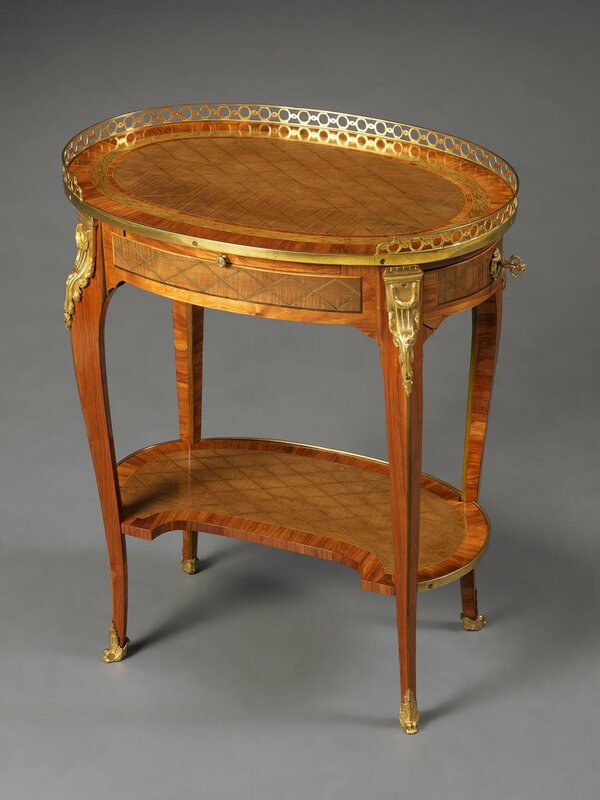 This particular table is made by Nicolas Petit (1732-1791). In literature he is referred to as Nicolas Petit I to distinguish him from Nicolas Petit II (1730-1797), who worked in the same period and the same line of work. 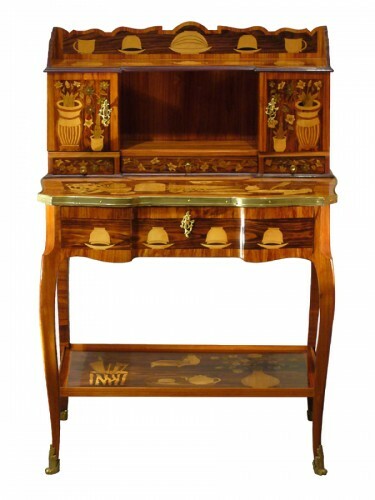 The furniture manufactured by Nicolas Petit I is, however, far superior to the production of his namesake. Nicolas Petit was born in Chaource and became maître ébéniste and marchand ébéniste in Paris in 1761. He established himself in the faubourg Saint-Anthoine, but his business did not prosper until after the death of his first wife in 1765. Nicolas Petit left behind a large body of work in quantity and diversity as well as in quality. 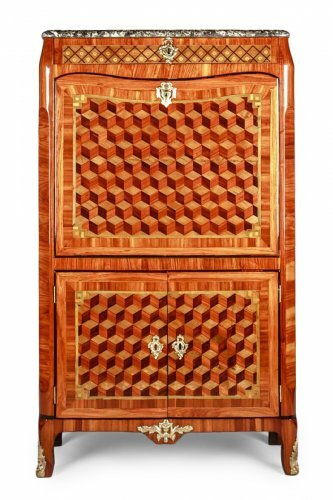 He made large chests and cupboards as well as commodes, writing furniture, side tables and a large diversity of occasional furniture. He also made casings for long case clocks. 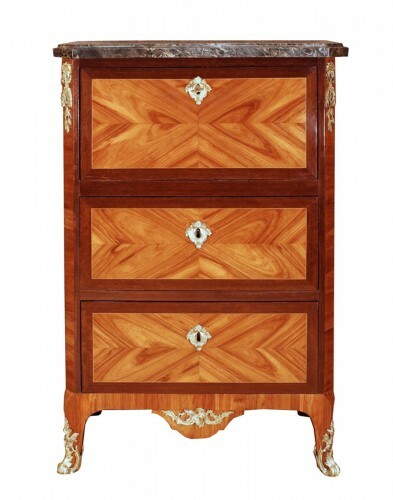 In general his furniture is decorated in marqueterie, but also in laquer. The diversity in decoration also spans a wide range, from lavish flower arrangements to stylized geometrical patterns.